Our chocolates are superb! Decadent and delicious, handmade and hand wrapped, each chocolate is produced with moments of sublime perfection in mind. Ostara Chocolate Co. helps you create that special token for your memorable moment – a memento for a product launch, a goodie bag surprise, an end-of-year gift for your clients or a desk drop for your promotion. We create what you require. Use the space provided to design your unique look – it is affordable, cost effective and a treat. Use the chocolate wrapper,a tag or a sticker to commemorate an anniversary, for a gender reveal party, to save the date to your wedding, as a wedding favour or as a hotel pillow turn down – countless ways to use our product. Request our price list which details our product flavours, measurements and weights. Choose a product which suits your budget and purpose best. Your foil colour completes the look, which colour would you prefer? Send us your logo/ design in high res jpeg, vector or .pdf and our designers will customise the blank space provided to you. A design fee is charged as a once-off per design and the price list details the cost per chocolate – inclusive of foil and paper wrapper (truffles/ coins excluded). Stickers, boxes, tags and ribbons are priced as add-ons. Choose our basic slab product (silver or gold foil, paper wrapper included), or step it up a notch and customise from start to finish! Custom Tags: Choose your shape, size, glossy or matt. Custom Ribbons: Satin, printed or plain, charged per metre, choose your colour and width. 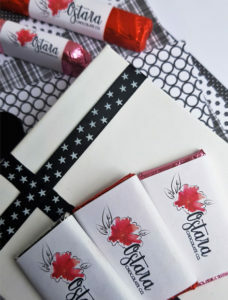 Ndungane Twins Foundation Ostara Chocolate Co. makes fabulous corporate chocolates for events and launches! Former Springboks Odwa and Akona Ndungane launched their charity foundation in spectacular fashion on Friday June 8, 2018 with a golf day at Serengeti Estate near Kempton Park, Johannesburg.